Episode 58 - The Battle Books, but not the battle, begin here. Since we are at the second most important beginning of the epic, aside from the very beginning, there is a lot of unnecessary material stuffed into the narrative. I tried my best to make sense of it, and to leave out the voluminous details that had nothing to do with the story at hand. I also tried to iron out the repeated descriptions of the armies' dispositions, and the scene of the two sides lined up prior to battle. This is one of the most difficult episodes I've had to produce, so I hope I was able to make some sense out of it. We also belatedly get an explanation for Sanjay's magic vision. It turns out Vyasa popped in and granted him that ability. Maybe this scene really occurred when Krishna was still in town for negotiations, because it was Krishna's conversation with Karna that Sanjay was first able to report on without actually being there. Otherwise, there is no explanation for those earlier feats of clairvoyance. This confusing little prelude leads right up to the Bhagavad Gita, which is the very next chapter in the Bhisma Parva. We'll begin on that in the next episode. It is also worth repeating the observation J.A.B. van Buitenen made about the composition of the two armies facing off at Kurukshetra. It turns out that the armies that allied with the Pandavas all came from kingdoms to the south and east of Hastinapur, while the Kauravas' allies were all from the north and west. The timeless pattern of Indian migrations and invasions has always been a flow of people coming out of the northwest and conquering or settling in the richer lands of the south and east. 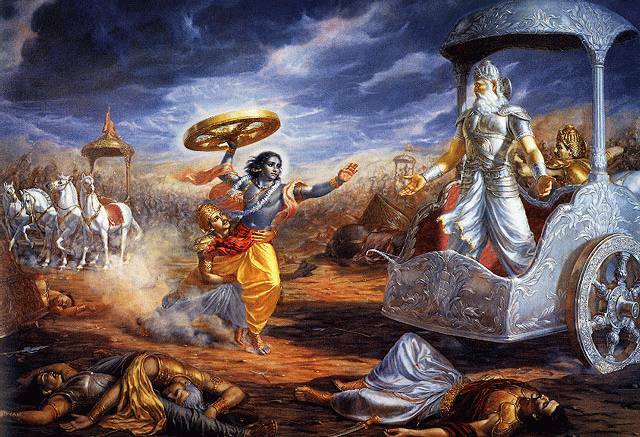 If there is some macro-economic or demographic movement happening behind the human drama, perhaps we are looking at a folk recollection of some past invasion, which was stopped by the Indian heroes and their advisor Krishna. Maybe Alexander was in there somewhere, on the Kauravas' side?! ?